Background: Transplanted islets may undergo primary graft non-function for various reasons. 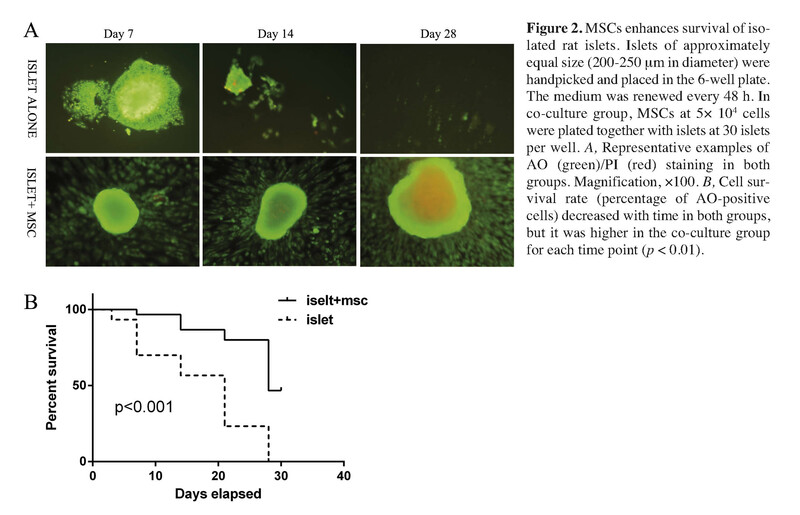 The aim of this study was to evaluate whether mesenchymal stem cells (MSC) could improve the viability of islets in vitro co-culture simultaneously and whether co-transplantation of MSC with islets could improve the function of islets in vivo. Materials and Methods: Rat islets were cultured in either the presence or absence of rat MSC in vitro. Cell viability was evaluated by acridine orange/propidium iodide staining. Cell function was evaluated by glucose-stimulated insulin secretion assay and confocal fluorescence imaging. Graft function was evaluated after co-transplantation of MSC with islets in a rat islet allograft model. Results: In the presence of MSC, 80% of the islets were still alive at day 14, while only 23% were alive when islets were cultured alone (p < 0.01). The insulin secretory responses to 16.7 mM glucose were significantly higher in the co-culture group when compared to islets cultured alone (p < 0.05). Two-photon and confocal fluorescence imaging showed that the whole-cell NAD(P)H fluorescence was >2-fold higher in the co-culture group than in the islets cultured alone group. In the rat islet allograft model, normal fasting blood glucose levels for the 1×106 MSCs+1000 islets group, 1×106 MSC+500 islets group, and the 1000 islets alone group were obtained for (21.0±1.7) days, (15±1.3) days, and (10.2±2.0) days; respectively. Discussion: Our data suggest that MSC, when they were co-cultured simultaneously with islets, may promote islet survival and in vitro can improve the function of islets and markedly reduce the islet mass required in rat model. Type 1 diabetes remains a therapeutic challenge. Insulin injection therapy has been the standard treatment for type 1 diabetes since the discovery of the hormone more than 80 years ago. Although intensive diabetes treatment with insulin reduces incidence and delays progression of long-term complications, such benefits of intensive diabetes treatment come with the an increased risk of severe hypoglycemia. Islet transplantation has recently shown improved potential for treatment of type 1 diabetes 1. In 2000, using a glucocorticoid-free immunosuppressive protocol that included sirolimus, low-dose tacrolimus, and a monoclonal antibody against the interleukin-2 receptor (daclizumab), Shapiro et al 2 carried out islet transplantation alone for seven patients with T1DM and a history of severe hypoglycemia and metabolic instability. The expansion of clinical trials in the post-Edmonton era indicates that pancreatic islet transplantation may finally be considered an effective alternative treatment for the most severe cases of Type 1 in diabetes 3 , 4 , 5 , 6 , 7 , 8 , 9 , 10 , 11 , 12 , 13 , 14 , 15 , 16 , 17. Despite such successes, transplanted islets may undergo primary graft non-function for various reasons, such as loss of islet viability during isolation and culture, insufficient nutrient and oxygen supply due to altered islet vasculature, inflammation and immune-mediated destruction, and the toxic effects of immunosuppressive agents 18 , 19. Therefore, great efforts have been made to develop new methods that can improve the viability of isolated islets and prolong their survival after transplantation with respect of islet shortage , 20 , 21 , 22 , 23. Mesenchymal stem cells (MSC) are rare residents of the bone marrow microenvironment and have been reported to differentiate into cells of bone, adipose tissue, and cartilage 24. Interestingly MSC can inhibit different effector functions of immune cell populations including T cells, B cells, dendritic cells (DC), and natural killer cells in vitro. MSC can also down regulate immune response in vivo and promote the survival of allogeneic skin transplant in animals 25 , 26 , 27. In addition, MSC have been shown to have renoprotective effects and enhance regeneration after acute kidney injury 28. Inflammation and immune-mediated destruction are the prominent factors contributing to primary non-function of transplanted islets but human MSC can protect human islets from pro-inflammatory cytokine 29, promote graft revascularization 30 , 31 , 32, and modulate immune cells 33. Rackham et al 34 reported that pre-culturing islets using a direct contact with pre prepared MSC monolayer could improve glucose-stimulated insulin secretion in vitro, which correlated with superior islet graft function in vivo. Subsequently, we hypothesized that MSC may promote islet survival when they are co-cultured simultaneously without a pre-prepared MSC monolayer in vitro. 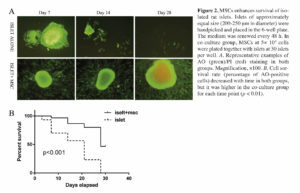 Accordingly, the current study was designed to investigate whether co-culture of MSC with islets simultaneously could enhance islet survival in vitro and whether co-transplantation of MSC with islet simultaneously could promote their survival in vivo, as indicated by islet function after transplantation. Male Sprague Dawley (SD) rats and Lewis rats (8-10 weeks old; body weight, 250-350 g) were purchased from Shanghai Laboratory Animal Center, Chinese Academy of Sciences. All rats were bred and maintained under specific pathogen-free conditions. The animal handling and experimental procedures were approved by the Animal Care and Use Committee of our hospital. Bone marrow (BM) was obtained from SD rats. Briefly, rats were scarified, and femurs and tibias were aseptically removed. Bone marrow was flushed from the shaft of the bone with DMEM medium containing 0.1% fetal bovine serum (FBS, Hyclone) plus penicillin/streptomycin and then filtered through a 200-µm sterile filter to produce a single-cell suspension. Mononuclear cells were isolated by Ficoll-Paque (Sigma-Aldrich, USA) density-gradient centrifugation from the filtered BM cells. Cells were then plated in DMEM plus 10% FBS and penicillin (100 U/ml)-streptomycin (0.1 mg/ml) and allowed to adhere for 48 h. Non-adherent cells were then removed. Medium was changed regularly every 3 d. At 80% confluence, cells were harvested with 0.25% trypsin and 0.02% EDTA and re-plated in the culture. Cells of passages 4-6 were used for both in vitro and in vivo experiments. Cells were phenotypically characterized by flow cytometry and their differentiation potential was evaluated by alizarin red and oil red O stained. Male Lewis rats were used as islet donors. Islets were isolated as previously described by Ricordi and Rastellini with some modifications 35. Briefly, rats were scarified with a cut in the heart under pentobarbital anesthesia (50 mg/kg, i.p.). A midline abdominal incision was made to expose the pancreas. The pancreatic duct was injected with 8-10 ml of 1 mg/ml collagenase P (Roche Molecular Biochemicals, Indianapolis, IN) in Hank’s buffered saline solution (HBSS) (Farco Chemical Supplies, Beijing, China). The pancreas was surgically removed and incubated at 37 ºC for 10 min, and then passed through a 500-µm mesh. The digested pancreas was rinsed with HBSS, and islets were separated by density gradient in Ficoll400 (Pharmacia). Islets were extensively washed in sterile HBSS and cultured in RPMI 1640 medium (GIBCO) supplemented with 0.2% NaHCO3, 1% (v/v) penicillin/-streptomycin, 5.6 mM D-glucose, and 2% fetal bovine serum (pH 7.4). Islets of approximately equal size (200-250 μm in diameter) were handpicked and placed in the 6-well plate. To standardize the islet mass for transplantation, one islet equivalent (IEQ) was defined as one 125-µm-diameter islet. Approximately 30 islets/well were maintained at 37 ºC in a humidified atmosphere with 5% CO2 for 20 days in either the presence or absence of MSC. The medium was changed every 24 h. In the islet alone group, 30 islets per well were cultured without MSC. In the co-culture group, 5× 104 MSCs were plated together with 30 islets per well. Islets viability was determined with acridine orange (AO)/propidium iodide (PI) staining. The numbers of AO and PI positive islets were counted under a fluorescence microscope. The percentage of live islets (survival rate) was determined by the number of AO-positive islets divided by the sum of PI and AO-positive islets. At days 1, 3 and 7 of the culture, the islets were evaluated for their glucose-stimulated insulin secretion. The assays were performed in triplicates as described previously 36. For both islets alone and islet + MSC group, survival islets, which were intact under microscope, were handpicked to eppendorf tubes. Each tube contained 30 islets and 400 µl serum- and glucose-free RPMI 1640 medium. The tubes were kept at 37 ºC for 30 min, and then the medium was completely removed by centrifugation (1,200 rpm, 2 min) and replaced with serum- free RPMI 1640 medium supplemented with 2.8 mM glucose. Following a 60-min incubation, the medium was completely removed and kept at –20 ºC for assay. These eppendorf tubes with islets were then incubated with serum-free RPMI 1640 containing 16.7 mM glucose for an additional 60-min. After a 60-min incubation, the medium was removed and kept at –20 ºC for assay. Insulin concentrations in the media samples were measured by immunoradiometric assay. The amount of insulin secreted at high glucose (16.7 mM) was divided by the amount at low glucose (2.8 mM), and the mean insulin stimulation index was calculated. Islets were handpicked and placed on 35-mm glass dishes (MatTek Corp, USA). In the islet + MSC group, 5× 104 MSCs were plated together with 30 islets per dish. In the islet alone group, islets at 30 islets per dish were plated without MSC. They were cultured in RPMI 1640 media supplemented with 11 mM glucose, 200 mM Hepes and 10% FBS (Hyclone) at 37°C in a humidified atmosphere containing 5% CO2. At day 7 the islets were placed on two-photon excitation microscopy. Two-photon imaging of the intensity NAD(P)H autofluorescence was performed on a Zeiss LSM 510 META laser scanning microscopy with 150-fsec pulses of 710-nm light from a Coherent Mira laser focused through a Plan-Apochromat 63× (N.A.=1.4) oil immersion objective (Zeiss). Diabetes was induced in SD rats by the intravenous injection of streptozocin (60 mg/kg body weight). Blood glucose levels were monitored daily from day 3 in the rats by using the Accu-Chek Advantage glucometer (Roche). Rats with fasting glucose level greater than 16.7 mmol/L for 5 continuous days were used. Islets of approximately equal size (200-250 μm in diameter) were handpicked for transplantation. The diabetic rats were randomly allocated to 4 groups. Rats in groups 1, 2, and 3 received 1000 islets + 1×106 MSC (n=8), 500 islets + 1×106 MSC (n=8), and 1000 islets (n=8), respectively through portal vein to the liver. Rats in group 4 received saline injection and served as a control (n=5). After transplantation, samples for fasting blood glucose and insulin levels were measured at days 5, 10, 20, and 30, respectively. The primary end point of the experiment was the number of days normoglycemia was maintained. The islet lost function was defined as fasting blood glucose levels >16.0 mM. Statistical analyses were performed using SPSS 13.0 for Windows (Chicago, IL, USA). Kaplan-Meier analysis was performed in each group. Differences between groups were tested using the log-rank statistic. Data are presented as the means± SD in each group. Data were analyzed using univariate analysis. If the F ratios were significant, post hoc tests were applied to assess significance. Results were considered significantly different if p < 0.05. MSC were prepared as previously described. Characterization of MSC in culture was analyzed by flow cytometry and differentiation tests. Results showed that the isolated MSC were negative for CD34, CD14 and CD45, while positive for CD105, CD73 and CD29 (Figure 1 A). They could be readily induced to differentiate into osteoblast and adipose cells (Figure 1 B, C). The islets of rats were round, and blood-red with staining of DTZ (Figure 1 D). Diameters were 50-200 μm. The range of the number of islets was 330-550 islets/rat. Islet purity was over 95%. Approximately, 30 islets/well were cultured in either the presence or absence of MSCs. When islets were cultured alone, most of them died at day 14 as assayed by AO-PI staining (Figure 2, A). In the presence of MSC, 80% of the islets were still alive at day 14, while only 23% were still alive in the islet alone group (p < 0.05). The islet viability rates were significantly higher in the islet + MSC group than those without MSC at each time points (p < 0.05) (Figure 2, B). To evaluate the insulin secretory activity of islets, the glucose stimulated insulin secretion (GSIS) in a two- hour static incubation assay at 2.8 mM and 16.7 mM was used. We compared the insulin secretion stimulating index (insulin secretion at 16.7 mM divided by insulin secretion at 2.8 mM) between the islet + MSC and the islet alone groups. The insulin secretion response to high glucose gradually decreased from day 1 to day 7 in both groups. Stimulating index (SI) was 3.1±0.52 and 2.0±0.44 at days 1 and 3, respectively in the islet alone group, and it was 3.3±0.62 and 2.5±0.51 at days 1 and 3, respectively in the islet + MSC group (n=3, p > 0.05; Table 1). However, SI of 1.6±0.36 in the islet + MSC group was significantly higher than SI of 1.0±0.08 in the islet alone group at day 7 (n=3, p < 0.05; Table 1). Glucose-induced insulin secretion is coupled to the metabolic state of the β-cells. After glucose is transported into the cell, glucose is phosphorylated and shunted into glycolysis, which increases metabolic flux. This altered metabolic state can be detected by NAD(P)H’s autofluorescences which increases and reflects the functional activity of islets 37 , 38. Two-photon and confocal fluorescence imaging showed that the whole-cell NAD(P)H fluorescence was >2-fold higher in the islet + MSC group than in the islet alone group by quantitative image analysis (data was not showed), indicating a better function of islets cultured in the presence of MSC (Figure 3). Having established that MSC can enhance islet function and survival in vitro, we tested next whether co-transplantation of MSC and islets could promote islet function in an allogeneic islet transplant model. Glucose monitoring was begun the day after transplantation. As shown in Figure 4 normal fasting blood glucose levels were obtained for (21.0±1.7) days, (15±1.3) days, and (10.2±2.0) days in the 1×106 MSCs + 1000 islets group, 1×106 MSCs + 500 islets group, and 1000 islets alone group, respectively. As an additional indicator for functional islets at post-transplant, fasting serum insulin levels were measured at 0, 5, 10, 20 and 30 days of post-transplantation. 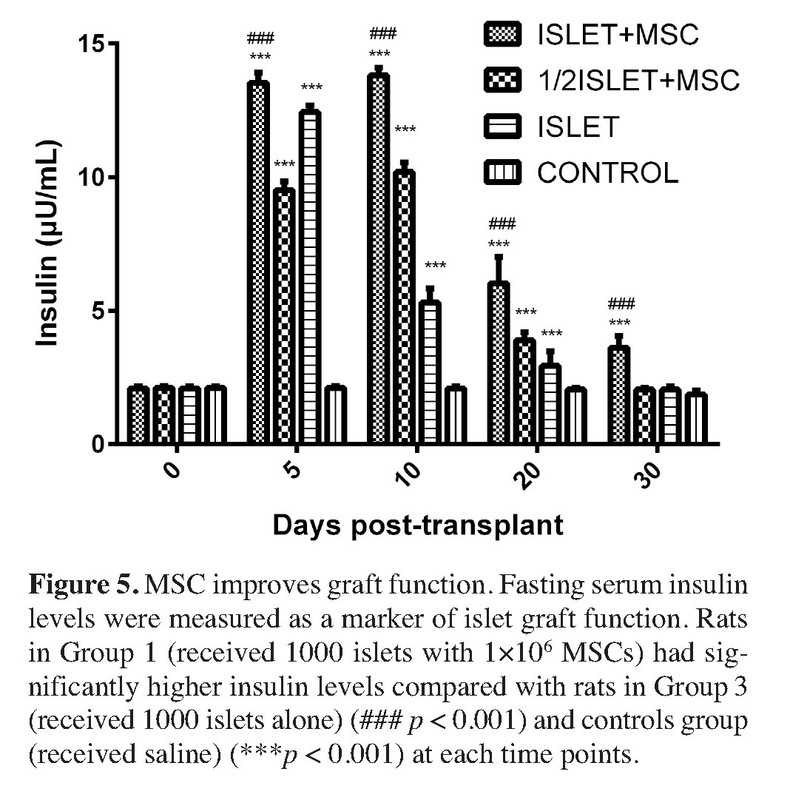 Data in Figure 5 illustrates that animals of islet co-transplanted with MSC had higher fasting serum insulin levels (µU/ml) of (13.54±0.36), (13.81±0.29), (6.03±0.97), and (3.62±0.43) in the MSCs + 1000 islets (group 1) and of (9.52±0.32), (10.18±0.37), (3.89±0.30), and (2.04±0.06) in the MSC + 500 islets (group 2) at post-transplant days 5, 10, 20 and 30, respectively, while compared to the fasting serum insulin levels of (12.43±0.24), (5.30±0.54), (2.94±0.54), and (2.04±0.12) in the 1000 islets alone (group 3) and of (2.10±0.08), (2.11±0.07), (2.09±0.07), and (1.86±0.14) in the control (group 4) at post-transplant days 5, 10, 20 and 30, respectively. Fasting serum insulin levels in the MSC + 1000 islets (group 1) was significantly higher than in the 1000 islets alone (group 3) (p < 0.001) and in the control (group 4) (p < 0.001) at each time point. 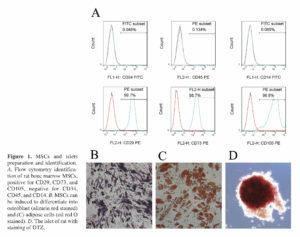 The primary findings of the present study are MSC can promote survival of islets in vitro in a co-culture simultaneously system without the need of pre-prepared MSC monolayers, which is different from the previous report 39, and that most importantly, co-transplantation of MSC and islets simultaneously resulted in a significant improvement of islet allograft engraftment. 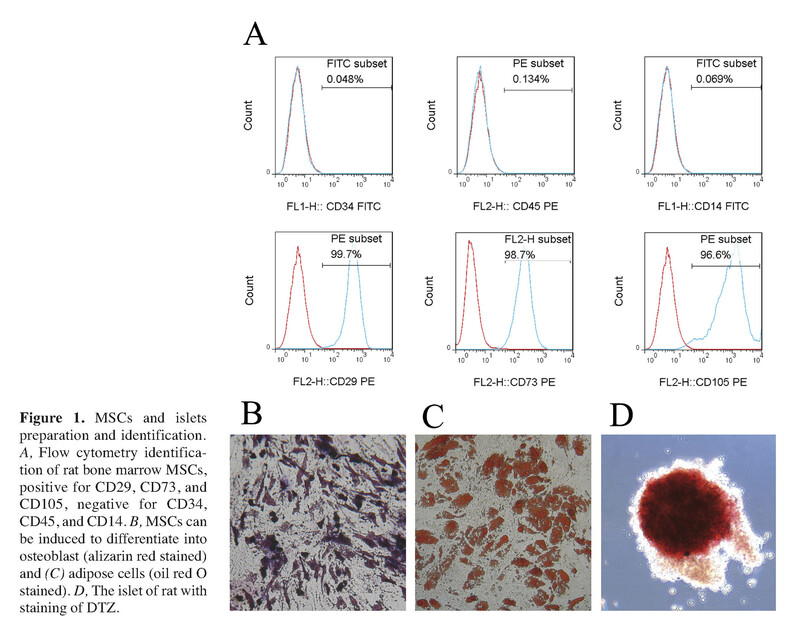 MSC are pluripotent cells capable of differentiation into many cell types. Furthermore, β cell-specific differentiation has been reported 40 , 41. MSC are particularly appealing to us in islet transplantation because these cells have immunomodulatory properties and the ability to protect cells from apoptosis. Moreover, they can be easily obtained from bone marrow and expanded in culture. Islets transplanted often fail to function (primary non-function) because of various reasons, including immunologic rejection, hypoxia, pro-inflammatory cytokines, and free radicals released from macrophages in the microenvironment of the transplanted islet, that will finally result in islet β-cell apoptosis 42 , 43 , 44 , 45. Therefore, most of the recipients have to be transplanted with islets from more than one donor 46. Different methods have been tried to promote islet survival in order to meet this clinical needs. For example, ex vivo gene transfer of bcl-2, an antiapoptotic gene, was cytoprotective for transplanted islets 47. Gunther showed that carbon monoxide, a product of heme oxygenase activity, protects β-cells from apoptosis through guanylate cyclase activation and when mouse islets were exposed to CO for 2 h they functioned significantly better after transplantation than islets not exposed to CO 48. In this study we tested the effects of MSC on the survival of islets based on the following facts: (i) MSC have been shown to secrete a lot of growth factors that may favor the survival of cells 49. (ii) MSC are capable of exerting a strong immune suppression 50 , 51. (iii) MSC have been shown to prevent cell apoptosis 52 , 53 , 54. In a severe hyperglycemia model produced in NOD/scid mice with daily low doses of streptozotocin, Lee et al. showed that intracardiac infusion of MSC lowered blood glucose levels in the diabetic mice 55. In the MSC-treated diabetic mice, there were increases in pancreatic islets and β cells producing mouse insulin. Very recently Ding et al. reported that administration of MSC significantly reduced delayed-type hypersensitivity responses to allogeneic antigen and profoundly prolonged the survival of fully allogeneic islet grafts in transplant recipients 56. They found that MSC can secret matrix metalloproteinases (MMPs), especially MMP-2 and MMP-9 that reduce surface expression of CD25 on responding T-cells and suppresses effects of MSC on T-cell responses to alloantigen. 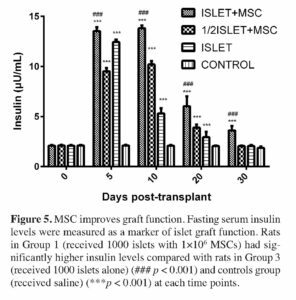 Interestingly, we also found lower blood glucose levels in rats receiving only MSC transplantation when compared to the control group, indicating that MSC may promote islet regeneration after streptozocin treatment (data not shown). Our results are consistent with findings in previous reports including a cynomolgus monkey model of islet/bone marrow transplantation, where Berman et al 57 demonstrated that MSC co-transplantation significantly enhanced islet engraftment and function at 1 month post-transplant compared with animals that received islets without MSCs. Additional infusions of donor or third-party MSCs might also decrease the risk of rejection. The authors also found that stable islet allograft function was associated with increased numbers of regulatory T-cells in peripheral blood, although it was not clear whether this was a direct effect of the MSC infusion. Similar results were obtained when syngeneic MSC were co-transplanted with islets into an omental pouch in a streptozotocin-induced diabetic rat model 58. More recently, several innovations have been developed to further facilitate islet transplantation. Kerby et al 59 co-encapsulated mouse islets and kidney MSC in alginate capsules and transplanted the capsules intraperitoneally into diabetic mice. They showed that MSCs could improve graft outcome in this microencapsulated/isolated-graft model of islet transplantation. Luo et al 60 co-cultured human islets and bone marrow (BM) to support human islet survival and function after transplantation into the left subrenal capsule of diabetic severe combined immunodeficient mice. The co-cultured human islets with MSC before transplantation demonstrated improved viability, increased size, and migration capacity in vitro. After 4 months, animals transplanted with precultured BM/islets exhibited euglycemia and detectable human insulin levels (157 μU/mL), whereas no human insulin was detected in the islet-only transplanted group. Because BM is readily available from the patients, it may represent an alternative cell source for MSC to enhance the survival and function of transplanted islets. The limitations of this study include not addressing the paracrine actions contributed to the protective effects of MSC in β cells due to difficulties in collecting sufficient transplanted islets for analysis. Other investigators 61 have found that MSC improve cardiac function after myocardial infarction or kidney function after acute renal injuries through secreting angiogenic and antiapoptotic factors. Secondly, we did not evaluate whether the infused MSC contributed, via differentiation and engraftment, to the cells of islets. Nevertheless, as autologous MSC have been shown to be safe when they are systemically infused and MSC can be produced in large quantity with an aspiration from bone marrow, MSC might be a useful therapeutic tool for improving islet transplantation in humans 62. In conclusion, we have shown that exposure of rat islets to MSC enhance their survival in vitro, and most importantly, co-transplantation of MSC and islets resulted in significantly improved functional performance after transplantation to a diabetic allogeneic recipient. Treatment with adult MSC offers a new approach to promote β-cell survival in addition to pharmacological interventions. Further study is needed to fully characterize the integration of MSC with transplanted islets, optimal cell number, and proprer delivery technique. This study was supported by funds of the Key Science Research Project of Fujian Province, China (No 2009Y4001) and the Key Laboratory of Fujian Province, China (No 2008Z1006). We thank Doctor Shuangmu Zhuo, Prof. Jianxin Chen and Shusen Xie of Key Laboratory of Optoelectronic Science and Technology for Medicine, Fujian Normal University, for performing the Two-photon and confocal fluorescence imaging. Piemonti L, Pileggi A. 25 Years of the Ricordi Automated Method for islet Isolation. CellR4 2013;1(1): 8-22. Shapiro AM, Lakey JR, Ryan EA, Korbutt GS, Toth E, Warnock GL, Kneteman NM, Rajotte RV. Islet transplantation in seven patients with type 1 diabetes mellitus using a glucocorticoid-free immunosuppressive regimen. N Engl J Med 2000; 343(4): 230-238. Ricordi C, Strom TB. Clinical islet transplantation: advances and immunological challenges. Nat Rev Immunol 2004; 4(4): 259-268. Ricordi C. Islet transplantation: a brave new world. Diabetes 2003; 52(7): 1595-1603. Shapiro AM, Ricordi C, Hering BJ, Auchincloss H, Lindblad R, Robertson RP, Secchi A, Brendel MD, Berney T, Brennan DC, Cagliero E, Alejandro R, Ryan EA, DiMercurio B, Morel P, Polonsky KS, Reems JA, Bretzel RG, Bertuzzi F, Froud T, Kandaswamy R, Sutherland DE, Eisenbarth G, Segal M, Preiksaitis J, Korbutt GS, Barton FB, Viviano L, Seyfert-Margolis V, Bluestone J, Lakey JR. International trial of the Edmonton protocol for islet transplantation. N Engl J Med 2006; 355(13): 1318-1330. Hering BJ, Kandaswamy R, Ansite JD, Eckman PM, Nakano M, Sawada T, Matsumoto I, Ihm SH, Zhang HJ, Parkey J, Hunter DW, Sutherland DE. Single-donor, marginal-dose islet transplantation in patients with type 1 diabetes. JAMA 2005; 293(7): 830-835. Hering BJ, Kandaswamy R, Harmon JV, Ansite JD, Clemmings SM, Sakai T, Paraskevas S, Eckman PM, Sageshima J, Nakano M, Sawada T, Matsumoto I, Zhang HJ, Sutherland DE, Bluestone JA. Transplantation of cultured islets from two-layer preserved pancreases in type 1 diabetes with anti-CD3 antibody. Am J Transplant 2004; 4(3): 390-401. Kessler L, Bucher P, Milliat-Guittard L, Benhamou PY, Berney T, Penfornis A, Badet L, Thivolet C, Bayle F, Oberholzer J, Renoult E, Brun MJ, Rifle G, Atlan C, Colin C, Morel P. Influence of islet transportation on pancreatic islet allotransplantation in type 1 diabetic patients within the Swiss-French GRAGIL network. Transplantation 2004; 77(8): 1301-1304. Markmann JF, Deng S, Huang X, Desai NM, Velidedeoglu EH, Lui C, Frank A, Markmann E, Palanjian M, Brayman K, Wolf B, Bell E, Vitamaniuk M, Doliba N, Matschinsky F, Barker CF, Naji A. Insulin independence following isolated islet transplantation and single islet infusions. Ann Surg 2003; 237(6): 741-749; discussion 49-50. Inverardi L, Kenyon NS, Ricordi C. Islet transplantation: immunological perspectives. Curr Opin Immunol 2003; 15(5): 507-511. Shapiro AM, Ricordi C, Hering B. Edmonton’s islet success has indeed been replicated elsewhere. Lancet 2003; 362(9391): 1242. Bertuzzi F, Ricordi C. Prediction of clinical outcome in islet allotransplantation. Diabetes Care 2007; 30(2): 410-417. Ricordi C, Hering BJ, Shapiro AM. Beta-cell transplantation for diabetes therapy. Lancet 2008; 372(9632): 27-28; author reply 29-30. McCall M, Shapiro AM. Update on islet transplantation. Cold Spring Harb Perspect Med 2012; 2(7): a007823. Jamiolkowski RM, Guo LY, Li YR, Shaffer SM, Naji A. Islet transplantation in type I diabetes mellitus. Yale J Biol Med 2012; 85(1): 37-43. Shapiro AMJ, Toso C, Imes S, Koh A, Kin T, O’Gorman D, et al. Five-year results of islet-alone transplantation match pancreas-alone transplantation with alemtuzumab, Tac/MMF, with strong suppression of auto and alloreactivity. Rev Diabet Stud 2011; 8(1): 95. Muller YD, Gupta S, Morel P, Borot S, Bettens F, Truchetet ME, Villard J, Seebach JD, Holmberg D, Toso C, Lobrinus JA, Bosco D, Berney T. Transplanted human pancreatic islets after long-term insulin independence. Am J Transplant 2013; 13(4): 1093-1097. Barshes NR, Wyllie S, Goss JA. Inflammation-mediated dysfunction and apoptosis in pancreatic islet transplantation: implications for intrahepatic grafts. J Leukoc Biol 2005; 77(5): 587-597. Narang AS, Mahato RI. Biological and biomaterial approaches for improved islet transplantation. Pharmacol Rev 2006; 58(2): 194-243. Anderson J, Deeds MC, Armstrong A, Gastineau D, Kudva Y. Utilization of a test gradient enhances islet recovery from deceased donor pancreases. Cytotherapy 2007; 9(7): 630-636. Carlsson PO, Palm F, Andersson A, Liss P. Markedly decreased oxygen tension in transplanted rat pancreatic islets irrespective of the implantation site. Diabetes 2001; 50(3): 489-495. Davalli AM, Scaglia L, Zangen DH, Hollister J, Bonner-Weir S, Weir GC. Vulnerability of islets in the immediate posttransplantation period. Dynamic changes in structure and function. Diabetes 1996; 45(9): 1161-1167. Tan J, Yang S, Cai J, Guo J, Huang L, Wu Z, Chen J, Liao L. Simultaneous islet and kidney transplantation in seven patients with type 1 diabetes and end-stage renal disease using a glucocorticoid-free immunosuppressive regimen with alemtuzumab induction. Diabetes 2008; 57(10): 2666-2671. Pittenger MF, Mackay AM, Beck SC, Jaiswal RK, Douglas R, Mosca JD, Moorman MA, Simonetti DW, Craig S, Marshak DR. Multilineage potential of adult human mesenchymal stem cells. Science 1999; 284(5411): 143-147. Battiwalla M, Hematti P. Mesenchymal stem cells in hematopoietic stem cell transplantation. Cytotherapy 2009; 11(5): 503-515. Nauta AJ, Fibbe WE. Immunomodulatory properties of mesenchymal stromal cells. Blood 2007; 110(10): 3499-3506. Zhao RC, Liao L, Han Q. Mechanisms of and perspectives on the mesenchymal stem cell in immunotherapy. J Lab Clin Med 2004; 143(5): 284-291. Lange C, Togel F, Ittrich H, Clayton F, Nolte-Ernsting C, Zander AR, Westenfelder C. Administered mesenchymal stem cells enhance recovery from ischemia/reperfusion-induced acute renal failure in rats. Kidney Int 2005; 68(4): 1613-1617. Yeung TY, Seeberger KL, Kin T, Adesida A, Jomha N, Shapiro AM, Korbutt GS. Human mesenchymal stem cells protect human islets from pro-inflammatory cytokines. PLoS One 2012; 7(5): e38189. Sakata N, Chan NK, Chrisler J, Obenaus A, Hathout E. Bone marrow cell cotransplantation with islets improves their vascularization and function. Transplantation 2010; 89(6): 686-693. Ito T, Itakura S, Todorov I, Rawson J, Asari S, Shintaku J, Nair I, Ferreri K, Kandeel F, Mullen Y. Mesenchymal stem cell and islet co-transplantation promotes graft revascularization and function. Transplantation 2010; 89(12): 1438-1445. Park KS, Kim YS, Kim JH, Choi B, Kim SH, Tan AH, Lee MS, Lee MK, Kwon CH, Joh JW, Kim SJ, Kim KW. Trophic molecules derived from human mesenchymal stem cells enhance survival, function, and angiogenesis of isolated islets after transplantation. Transplantation 2010; 89(5): 509-517. Li FR, Wang XG, Deng CY, Qi H, Ren LL, Zhou HX. Immune modulation of co-transplantation mesenchymal stem cells with islet on T and dendritic cells. Clin Exp Immunol 2010; 161(2): 357-363. Rackham CL, Dhadda PK, Chagastelles PC, Simpson SJ, Dattani AA, Bowe JE, Jones PM, King AJ. Pre-culturing islets with mesenchymal stromal cells using a direct contact configuration is beneficial for transplantation outcome in diabetic mice. Cytotherapy 2013; 15(4): 449-459. Ricordi C, Rastellini C. Automated method for pancreatic islet separation. In: Methods in Cell Transplantation. C. Ricordi (Ed. ), RG Landes (Pub.). Austin, Texas, 1995; pp. 433-438. Marchetti P, Dotta F, Ling Z, Lupi R, Del Guerra S, Santangelo C, Realacci M, Marselli L, Di Mario U, Navalesi R. Function of pancreatic islets isolated from a type 1 diabetic patient. Diabetes Care 2000; 23(5): 701-703. Patterson GH, Knobel SM, Arkhammar P, Thastrup O, Piston DW. Separation of the glucose-stimulated cytoplasmic and mitochondrial NAD(P)H responses in pancreatic islet beta cells. Proc Natl Acad Sci U S A 2000; 97(10): 5203-5207. Rocheleau JV, Head WS, Piston DW. Quantitative NAD(P)H/flavoprotein autofluorescence imaging reveals metabolic mechanisms of pancreatic islet pyruvate response. J Biol Chem 2004; 279(30): 31780-31787. Choi KS, Shin JS, Lee JJ, Kim YS, Kim SB, Kim CW. In vitro trans-differentiation of rat mesenchymal cells into insulin-producing cells by rat pancreatic extract. Biochem Biophys Res Commun 2005; 330(4): 1299-1305. Timper K, Seboek D, Eberhardt M, Linscheid P, Christ-Crain M, Keller U, Muller B, Zulewski H. Human adipose tissue-derived mesenchymal stem cells differentiate into insulin, somatostatin, and glucagon expressing cells. Biochem Biophys Res Commun 2006; 341(4): 1135-1140. Arnush M, Heitmeier MR, Scarim AL, Marino MH, Manning PT, Corbett JA. IL-1 produced and released endogenously within human islets inhibits beta cell function. J Clin Invest 1998; 102(3): 516-526. Kaufman DB, Platt JL, Rabe FL, Dunn DL, Bach FH, Sutherland DE. Differential roles of Mac-1+ cells, and CD4+ and CD8+ T lymphocytes in primary nonfunction and classic rejection of islet allografts. J Exp Med 1990; 172(1): 291-302. Mandrup-Poulsen T, Bendtzen K, Dinarello CA, Nerup J. Human tumor necrosis factor potentiates human interleukin 1-mediated rat pancreatic beta-cell cytotoxicity. J Immunol 1987; 139(12): 4077-4082. Rabinovitch A, Suarez-Pinzon W, Strynadka K, Ju Q, Edelstein D, Brownlee M, Korbutt GS, Rajotte RV. Transfection of human pancreatic islets with an anti-apoptotic gene (bcl-2) protects beta-cells from cytokine-induced destruction. Diabetes 1999; 48(6): 1223-1229. Gunther L, Berberat PO, Haga M, Brouard S, Smith RN, Soares MP, Bach FH, Tobiasch E. Carbon monoxide protects pancreatic beta-cells from apoptosis and improves islet function/survival after transplantation. Diabetes 2002; 51(4): 994-999. Longoni B, Szilagyi E, Quaranta P, Paoli GT, Tripodi S, Urbani S, Mazzanti B, Rossi B, Fanci R, Demontis GC, Marzola P, Saccardi R, Cintorino M, Mosca F. Mesenchymal stem cells prevent acute rejection and prolong graft function in pancreatic islet transplantation. Diabetes Technol Ther 2010; 12(6): 435-446. Lee RH, Seo MJ, Reger RL, Spees JL, Pulin AA, Olson SD, Prockop DJ. Multipotent stromal cells from human marrow home to and promote repair of pancreatic islets and renal glomeruli in diabetic NOD/scid mice. Proc Natl Acad Sci U S A 2006; 103(46): 17438-17443. Ding Y, Xu D, Feng G, Bushell A, Muschel RJ, Wood KJ. Mesenchymal stem cells prevent the rejection of fully allogenic islet grafts by the immunosuppressive activity of matrix metalloproteinase-2 and -9. Diabetes 2009; 58(8): 1797-1806. Berman DM, Willman MA, Han D, Kleiner G, Kenyon NM, Cabrera O, Karl JA, Wiseman RW, O’Connor DH, Bartholomew AM, Kenyon NS. Mesenchymal stem cells enhance allogeneic islet engraftment in nonhuman primates. Diabetes 2010; 59(10): 2558-2568. Solari MG, Srinivasan S, Boumaza I, Unadkat J, Harb G, Garcia-Ocana A, Feili-Hariri M. Marginal mass islet transplantation with autologous mesenchymal stem cells promotes long-term islet allograft survival and sustained normoglycemia. J Autoimmun 2009; 32(2): 116-124. Kerby A, Jones ES, Jones PM, King AJ. Co-transplantation of islets with mesenchymal stem cells in microcapsules demonstrates graft outcome can be improved in an isolated-graft model of islet transplantation in mice. Cytotherapy 2013; 15(2): 192-200. Luo JZ, Xiong F, Al-Homsi AS, Ricordi C, Luo L. Allogeneic bone marrow cocultured with human islets significantly improves islet survival and function in vivo. Transplantation 2013; 95(6): 801-809. Rehman J, Traktuev D, Li J, Merfeld-Clauss S, Temm-Grove CJ, Bovenkerk JE, Pell CL, Johnstone BH, Considine RV, March KL. Secretion of angiogenic and antiapoptotic factors by human adipose stromal cells. Circulation 2004; 109(10): 1292-1298. Dominguez-Bendala J, Lanzoni G, Inverardi L, Ricordi C. Concise review: mesenchymal stem cells for diabetes. Stem Cells Transl Med 2012; 1(1): 59-63.